2015 I WRAPS I 69 Steve Carney is the owner of Carbon Wraps, a custom vehicle wrap company based in Orlando, Florida. He has been designing and installing wraps for more than 10 years, and he specializes in wrapping luxury and exotic vehicles throughout central Florida. M y brother and fellow wraps installer Clint and I did this particular job for our friend and client Robert Himler, an exotic car enthusiast who also runs a blog called CarVideos.com (www.carvideos.com). Carbon Wraps has wrapped many of Rob's exotic vehicles over the years, but this time he had something special—a custom McLaren MP4-12c. 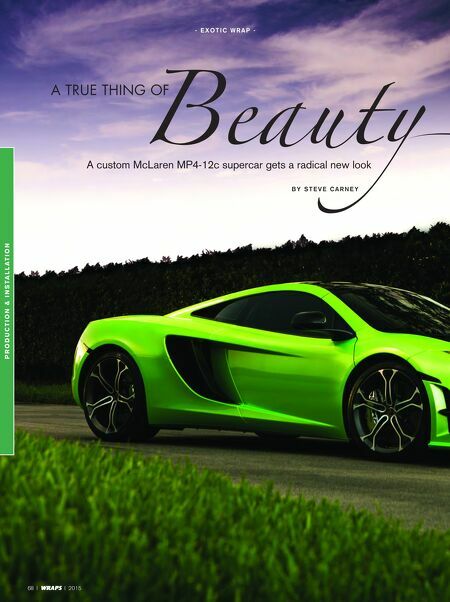 The car, built by McLaren's MSO (McLaren Special Operations) division, is truly a thing of beauty. The vehicle features a full package of bespoke features, including a revised hood, front wing louvers, new rear wing vents, a unique airbrake, and a roof that sports an integrated snorkel that channels air into the engine. 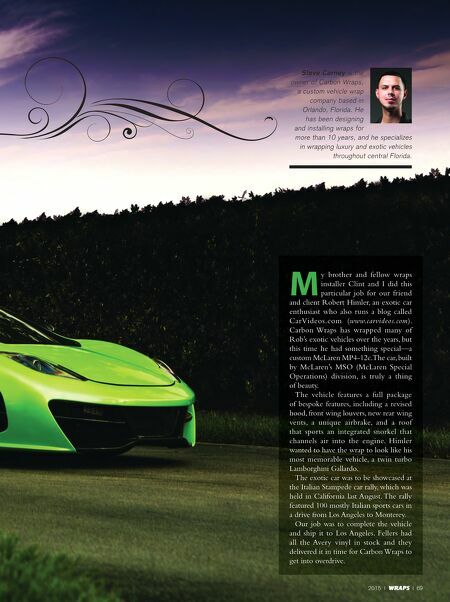 Himler wanted to have the wrap to look like his most memorable vehicle, a twin turbo Lamborghini Gallardo. The exotic car was to be showcased at the Italian Stampede car rally, which was held in California last August. The rally featured 100 mostly Italian sports cars in a drive from Los Angeles to Monterey. Our job was to complete the vehicle and ship it to Los Angeles. Fellers had all the Avery vinyl in stock and they delivered it in time for Carbon Wraps to get into overdrive.